In Singapore, neighbourhood cafés are being ‘disrupted’ by a new foodie trend: vending machine cafes that serve up blast-chilled dinners, ready to eat or frozen, called Chef-in-Box. IT IS NO secret that Singapore has designs on becoming a world leader in technology. So it should come as no surprise that one of the food trends currently sweeping the nation is a chain of 24-hour cafes comprised solely of vending machines, serving everything from seafood paella to claypot chicken rice. Chef-in-Box opened the country’s first so-called VendCafe in August 2016 in a public housing block (HDB). The food is made in a central kitchen in Singapore, blast-chilled for safety and shelf life, and then shipped out to a total of 100 machines dotted across the country. Customers can order their dish piping hot – which takes three minutes to serve – or frozen, so that they can reheat the meal from the comfort of their own home. 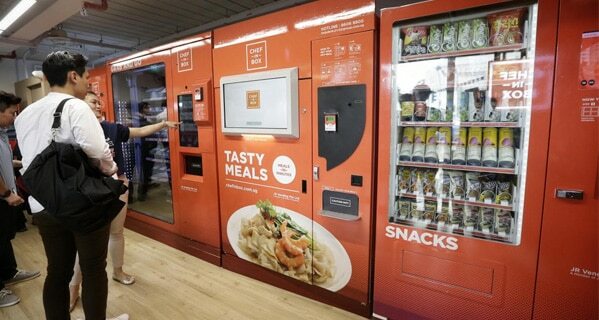 “We wanted to disrupt our industry,” Jocelyn Chng, CEO of Chef-in-Box’s parent company JR Food Group, says of the decision to venture into the world of vending machine cafes. “With the VendCafe, we don’t need chefs or service staff to be at a hundred locations, and we can pass all these savings to the customers.” (The prices of main courses range from SGD 3.50 (R32) to SGD (R46). Off the back of the successful launch of its first VendCafe, when citizens from across the city faced 90-minute queues to get their hands on one of the bento boxes being pumped out from a wall of fluorescent orange vending machines, the company opened a further five VendCafes – either within HDBs or at train stations. According to Chng, the company chose to open VendCafes within the country’s housing estates to bridge the gap in amenities typically found at such locations. “People in the residential estates don’t have [access] to full amenities. So they have a need for the VendCafe concept because it is convenient,” says Chng. The main challenge has been changing people’s perception of ready meals as unhealthy and tasteless, says Chng. Steps taken by the company include displaying nutritional information on the vending machine bento boxes and playing videos of the chefs cooking the dishes while customers wait for their food. And the brand is set to go overseas in the near future.